Your web site content is scarry. Is it that you are so totally confused, missled, decieved, or just want to irritate? If you are basing your assessment of our commander in chief upon the pablum, missrepresentation, and propaganda of the media, then you are not using the brain God gave you. 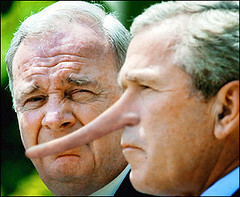 Most of America will never know how much President Bush protected them from destruction. We owe him our aliegance, not our disdain. I am not basing my assessment of our commander in chief on any propaganda. Moreover, the propaganda most often works in his favor, allowing him to accumulate power in the executive branch while people are “convinced” that it is necessary for our security. The Constitution (which you, Roy, and others have sworn to defend and uphold) served (and serves) to pull down power from a central figure, thus preventing a dictatorship. Sadly, it hasn’t worked that well. With the PATRIOT Act, Military Commissions Act, John Warner Defense Act, and others (including a record setting number of signing statements and executive orders) handed down by the Bush administration, we have seen our Republic degrade into a dictatorial empire at an alarming rate. Roy (and others): please do your homework. Resist the urge to title as “propaganda” anything that uses fact and historical precedent to show how our current President has abused the powers of his office and subverted the Constitution. Shake off the dust of blind loyalty to a single man, and honor the oath you took to defend and uphold the Constitution of this land. Only then will our country stand a chance of surviving intact. I have a nephew who is presently on his way to Iraq. Before he left, I asked him and his friend to watch for those supposed Weapons of Mass Destruction while they were there. They responded in all sincerity to me that they already had found those weapons. This indicates the amount of brainwashing that is done to those in the military. They have been taught, apparently, that WMD were found, and therefore their presence in Iraq is just. I submit, in all honesty, that Roy is brainwashed also. But Connor, he is correct in one of his statements, your website is scarey. It is scarey because in most things Connor is the one with his eyes wide open, while many other Bush loyalists have had their eyes blinded. A scripture in Matthew comes to mind – In the last days, even the very elect will be deceived. It’s people like Roy that think we need more attacks on America to realize just how great our protector (Bush) is and how safe we are, coddled in the arms of the State. Well said Kelly and Conner, do they really teach them that WMD were found, the politicians admitted none were found, even main stream media has reported it, that is unreal that they could believe it. What happened to sense and honesty? I’m not going to start an argument or take sides, but I’m definitely going to correct the ridiculousness in your post. 1. Propaganda – “Propaganda is a type of message aimed at influencing the opinions or behavior of people” – Review your blog. You ARE the propaganda. 2. The Patriot ACT – Strangely enough, acts of Congress are passed by, you guessed it, Congress. The Constitution you proclaim to uphold created Congress to balance power and create laws on the people’s behalf. If a law gave President Bush too much power it is our fault, not his. We elected those who gave it to him. That includes you. Either you recognize that the system set up by the Constitution works and you are wrong or the Constitution is broken and your “sour grapes” aren’t in vain. 3. Military oath – Read it ( http://www.army.mil/cmh-pg/faq/oaths.htm ). Our military is to uphold both the Constitution AND the President. He is after all the Commander in Chief. 4. Brainwashing – Why is it that anyone who doesn’t agree with you (the collective “you”) must have something wrong with them? How is it that “you” (posters included) know more than people who have actually been in Iraq? Connor, don’t bully people telling them to do their homework when you clearly haven’t. Take some “humility pills” and bring it back down to the facts. D&C 50:6-8. 1. So then isn’t this post, and yours also propaganda? 2. So if we elect someone we’re not allowed to criticise them after they’ve taken office? 3. Notice how the Constitution is listed *first. * I’m guessing that’s not on accident. I have a completely hypothetical question for you: what if the President screws with the Constitution? 4. Do people have to go to Iraq to weigh in on current events or foreign policy? Why is it that people who have gone expect others to shut up because they haven’t? I think its horrifically ironic that you’ve just asked someone else to take “humility pills.” Classic. 1. Yep, for sure. I’m trying to convince people to use the facts. He’s trying to convince people not to be loyal to Bush. He has every right to do that, but he can’t claim he isn’t influenced by propaganda when he’s writing it. Welcome to my point. 2. Criticize anyone you want. Unfortunately that’s not the point either. He said the Bush administration is pushing those Acts on everyone when it is Congress who passed them. If you think the Acts are stupid, 1) don’t vote for those people anymore and 2) blame the right people: us. 3. The Constitution should come first. The President answers to the Constitution. The Constitution gives the President the power to put into practice and oversee laws created through the Constitution’s system of government. Moreover, the President can’t screw with the Constitution, hence the purpose of the Supreme Court. 4. Notice how I haven’t faulted anyone for weighing in on current events or foreign policy. In fact, you don’t even know my opinions on them. I have only spoken out about the validity of the arguments here. I don’t believe that soldiers who have gone to Iraq expect others to shut up because they haven’t gone. I also don’t believe you can label people who have gone as brainwashed just because you haven’t. I’m glad you liked it. I’m working on my humility, you? Might I recommend reading the book Propaganda by the father of propaganda, Edward Bernays. He who reads it will learn two main points: 1. Propaganda can be used for good and evil purposes (much like anything else), and 2. Propaganda essentially means “propagation”, in that you are propagating your ideas to the masses. In our day, because of widespread abuse, the term “propaganda” carries a negative connotation. We see propaganda as coming from sources that would hide facts and jade truth in order to sway you a certain way, while unadulterated evidence would not necessarily be interpreted as “propaganda”. On my blog I often take the stance (whether explicitly or implicitly implied) that my readers should not look to me as a source of final truth. I present evidence, comment on stories, and point the reader to an issue I feel important, while adding my own commentary and encouraging debate. Much like a good missionary in the field, I would encourage my readers to read up on these subjects and ponder them themselves, rather than quoting me as an authoritative source of knowledge. 2. The Patriot ACT – Strangely enough, acts of Congress are passed by, you guessed it, Congress. Most definitely. Are you aware, however, of the pressure that is often applied by the executive branch in hurrying along a vote, condemning those who want a debate on the issue (labeling them as “not supporting the troops” and as “unpatriotic”)? Are you aware of how little time was given to Congress to read the (long) PATRIOT Act before the vote took place? Hint: very, very little. Blame is equally shared between Congress (except Ron Paul) and our executive branch. If a law gave President Bush too much power it is our fault, not his. Military oath… Our military is to uphold both the Constitution AND the President. He is after all the Commander in Chief. I agree with John. The Constitution comes before the President, any day of the week. Brainwashing – Why is it that anyone who doesn’t agree with you (the collective “you”) must have something wrong with them? Take that up with those who have commented on my post. I never suggested brainwashing, though the use of government-created propaganda and demands for explicit obedience to the chain of command definitely create an environment where most (thankfully not all) of our armed forces do what they are told, with little regard for the Constitution. Connor, don’t bully people telling them to do their homework when you clearly haven’t. Take some “humility pills” and bring it back down to the facts. Facts are all I’m concerned about. Feel free to add more to the discussion at your discretion. Moreover, the President can’t screw with the Constitution, hence the purpose of the Supreme Court. Ummm.. ever heard of the Military Commissions Act? Habeas Corpus? FISA Courts? I would “humbly” submit to you that he can, and he has. Perhaps you would learn some enlightening facts in Glenn Greenwald’s How Would A Patriot Act?. The facts clearly, clearly demonstrate that our president has abused the authority of his office, sidestepped the rule of law, and shown an utter disdain and disregard for our Constitution. Every once in a great while I remember that there are some conservatives who actually promote American values: checks and balances, limited executive power, rule of law rather than rule of man, democracy over monarchy. I usually find them here. That I disagree on many other issues is beside the point; you guys are okay. Also: That Bush hasn’t managed to destroy America despite the complete failure of Congress and the press is a sign of America’s great strength. One definition of propaganda I’ve heard is ‘information designed to promote an organisation or philosophy, rather than the facts.’ Could we benefit from that definition? Last thing: Romney (and others) points out that the ‘Constitution hanging by a thread’ quote is likely a baseless fabrication that no LDS who understands his or her religion would ever accept. Comments? I was the one who brought up the word brainwashing. I stand by that word. The military’s job is to BRAINWASH all enlistees. As a side note, I am not condemning Ron Paul. I haven’t (yet) done any research on him or his politics. He may be a great guy and good presidential candidate. My purpose is to slow the tide of the bashing we tend to do in the name of political beliefs. There is too much uninformed denigration (not necessarily by Connor) and never any positive remarks. When was the last time that someone presented a constructive suggestion to a problem instead of focusing on Bush-hating? Too long ago. To a certain degree, yes. If I elect a despot, then when the despot uses his power for evil, I’m partly to blame. However, if I elect a man who preaches limited government, humble taxation, and general conservatism (as GWB did in 2000), yet then bloats government, increases taxes and skyrockets the national debt, and is anything but conservative, am I to blame? If the person I elect goes back on his word, changes his mind, or acts contrary to his promises, am I not entitled to the desire to hurl the sycophant from office? Yes, he has. In fact, quite often in his speeches he issues a warning voice to his colleagues, urging them to debate the issue, think it out, and analyze the proposition from a historical and Constitutional context, rather than simply pushing it through to a vote at the behest of the leaders. He was one of three Republicans in the House who voted against the PATRIOT Act, when the rest of them (largely without reading or debating its nightmarish elements) voted it through in a hurry, mush to Bush’ pleasure. It’s frightening how much power we’ve given a single man in our nation. Habeas corpus went out the window with the Military Commissions Act, and now the President is able to lock anybody up he pleases, a power which classifies he who wields it as a dictator. There is too much uninformed denigration (not necessarily by Connor) and never any positive remarks. I’m quick to give high praise to any man who abides by the Constitution and shows intellectual honesty, an understanding of historical precedent, and personal integrity. Ron Paul is at the top of the list, and so he receives frequent attention on my blog. I agree that we shouldn’t bash for bashing’s sake, but when a man in power uses it to suppress liberty, sidestep the founding documents of this nation, or exploit others for the benefit of a special interest minority, then I will call them out on it. When was the last time that someone presented a constructive suggestion to a problem instead of focusing on Bush-hating? Too long ago. Everybody ought to contemplate for just one moment about the Patriot Act. That piece of legislation is over 800 pages long, and was introduced to Congress sight-unseen within 5 weeks of 9/11. They got edited copies of those 800+ pages like the morning of their vote on it. No one had a chance to read those 800+ pages before voting upon it. Ron Paul was smart – even if he declined to vote for it merely upon the principle of the thing! I’m sure he suspected they were trying to foist upon us some secret agenda, because WHY would a piece of legislation be forced to vote in such a manner? So ask yourself two simple questions: 1) When was the 800 page Patriot Act written? It is logical to assume the writing of it was well before 9/11, because who can write such a work of legislation between 9/11/01 and the few weeks later when it was voted upon? 2) Who wrote the Patriot Act? Just try googling that! We don’t even know who the authors are! There are suspicions as to who wrote it, but no one actually owns up to it. I smell secret dealings here. I think we’re safe in assuming that what the government tells us about these two questions is pure propaganda. Seems like some might disagree. Whether Cheney meant to say that or simply hasn’t brushed up on the highly important oath our armed forces take, this slip-up illustrates his understanding of and mentality in regards to the Constitution: he doesn’t care. You’ve never misspoke? I believe you’ve contradicted yourself in this very blog posting. When did I claim that I’ve never misspoken? Where did you even pull that from? That quote you cite was an indictment against lazy, apathetic Americans who are disinterested in and ignorant of our current political situation. It was a generalization that I stand by, fully understanding that there is a minority to which this statement does not apply. There certainly are people who are engaged in the process, and for that I am grateful. But yes, in large part we as Americans have outsourced politics and let those in charge run the show. It’s created a world of hurt, but that in no way excuses nor vindicates those who have abused the power they have. Blame is to be shared among all culpable, though it ultimately lays at the doorstep of those who have used their power to suppress liberty and ignore the Constitution. I think you have done a good job at illustrating the point of the original post. Some people get so wrapped up in their loyalty to a group or to a leader that they begin to shut down to any idea that doesn’t fit within their pre-determined version of reality. Now that you feel that you have no good facts to base your dissent upon, you will preceed to question the sanity of the posters here. Isn’t that the intent of your last post? Resorting to personal attacks is the domain of someone who has lost the debate. Feel free to make that one your last post, but hopefully you will elevate your dialogue on other sites you might visit. Fun thought! Did we or did we not land on the moon? I know some people who seriously have doubts. Actually, if we DIDN’T land on the moon, why would we have staged such an episode? Probably for the same reason our government lies about things like Gulf of Tonkin, WMD, etc. They lie about those things to support the Military-Industrial Complex (people like Carlyle Group and Halliburton). So, perhaps the moon landing might have been staged for the MI Complex to profit from. I think their can be a discussion on both sides of the issue here. I believe loyalty, allegiance, respect, and honor are given according to the merits of those who are in a position to demand them. For instance as latter-day saints we should give the greatest loyalty, honor, and respect to God, because He deserves it. We don’t do this blindly, but choose Him with our eyes open to His plan and His way. From the legislation that HE has proposed and that HE has pushed through congress, he has defied the Constitution and has worked to weaken and attack its principles. He has assumed too much authority which can be used against the citizens of our country. Will he overtly harm innocent people? Probably not, but does HIS legislation open the door for the future dictators of America? YES! Is he the sole cause for the destruction of our liberties? No, it’s been a long time coming, however, he has pushed the anti-Constitution agenda further and faster than previous administrations. As a conservative, I also disagree the way that he is spending money on huge entitlement and bureaucratic programs such as no child left behind, prescription drug program, and DHLS (instead of working to shrink existing ones). As a conservative I disagree with him on foreign interventionism. As a conservative I disagree with him on running this country into the poor house by ballooning our national debt and creating a dollar crisis together with the Federal Reserve. Also notice that he never dealt with abortion, gay marriage, social security, and a host of other emotional issues that he promised to deal with. In short those are my arguments for giving my allegiance to our president. We need someone else in office who will take the oath of office seriously. He has assumed too much authority which can be used against the citizens of our country. Will he overtly harm innocent people? Probably not, but does HIS legislation open the door for the future dictators of America? YES! This is an important observation. We could have the greatest and nicest guy for a president who never seemed to abuse his power, but if he disregards constitutional principles and paves the way for a future president to “legally” trample on our freedoms — he has done a HUGE disservice to our country. Someone who does this doesn’t deserve to be in a position where the primary responsibility is to “preserve, protect and defend the Constitution”. We need to judge our leaders by their actions and hold them accountable. The constitution deserves our allegiance much more than they do. We should be electing a protector of the constitution, not an American Idol, and we need to understand the difference. We could have the greatest and nicest guy for a president who never seemed to abuse his power, but if he disregards constitutional principles and paves the way for a future president to “legally” trample on our freedoms — he has done a HUGE disservice to our country. We should be electing a protector of the constitution, not an American Idol, and we need to understand the difference. Anybody catch how Ron Paul introduced himself in last night’s GOP debate? As “the Champion of the Constitution”. I am a former Marine I disagree with Roy. We owe our allegiance to the Constitution, not to one man or one office. Roy’s line of thinking is exactly what brought down the Roman Republic. Soldiers began swearing loyalty to their generals instead of to the state.